When cooking should be treated like monk fish. Pan fry 2-3 minutes each side, then allow to rest for a few minutes before serving with a slice of lemon. To enjoy the flavour keep it plain and simple. 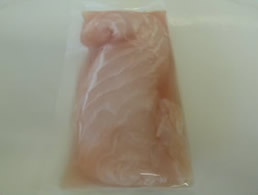 Available in 100g, 120g and 150g portions.